For old-school adventure gamers, Jane Jensen needs no introduction. Her crafted gaming experiences rest indelibly on their minds: the fervent mouse-clicks leading them to discover forgotten Wagner operas about lycanthropy hidden in Castle Neuschwanstein, compose the holy geometry of Le Serpent Rouge in Rennes-le-Château or decode red brick scrawling on New Orleans tombs in order to communicate with voodoo magic men; clicks that lead them closer to, as she calls it, "the big picture." The Escapist caught up with Jensen at a restaurant near her Seattle home to talk about her latest epic, currently titled Gray Matter, scheduled for release in 2008. The Escapist: What kind of games did you play as a child? Jane Jensen: I played alone a lot as a kid, because I was so much younger than all my siblings. I've always been into detailed patterns. My mom had a huge old box of quilt squares, and I would lay them out on our stairs and spend hours swapping them around into different arrangements. I would just make something up and then mix the pieces up and make something else. I'm really into details. 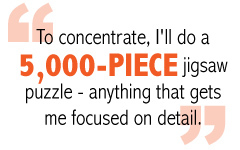 To concentrate, I'll do a 5,000-piece jigsaw puzzle - anything that gets me focused on detail, I'll be into that. That's one of the things I love about making games, is that it's a complex, detailed process. It's like computer programming: You write up a long list of commands, and every single thing has to be in the right place. Doing a computer game is like programming, except with fiction. You collect all these plot points and put them in the right places and create this complex matrix of story. TE: You've brought language into your quilt pattern puzzles. JJ: Almost every game I do is a mystery. I like them because a mystery is saying, "I know the whole picture. Now you tell me what it looks like." You can imagine the background of what happened as a big picture. And then I take it apart into little pieces of information and decide when the player learns that little piece of information and how they learn it. You don't want to find three cryptic notes with different information. You want to mix it up a little bit, build it all into a unique sequence. TE: Do you ever imagine Grace and Gabriel trapped in a dusty closet in some Sierra On-Line warehouse, waiting for you to come and open the door? JJ: No. I mean, I would love to do another story with them, but it's really not the end of my life if I don't. It's been so long now. TE: Are you forging a new bond with Samantha, the main character in Gray Matter? JJ: I actually really like David, the other main character. He's a very dark person, and he's kinda screwed up and very interesting to write. I found when I was writing my books that it's not usually the principal character that's fun to write, because they tend to have to be the "straight man." Gabriel was great because he had this really obnoxious sense of humor, but Samantha doesn't have that. She's not particularly funny. David's more fun to write.